The late writer Ray Bradbury, he passed away at age 91 on Tuesday, June 5, 2012, is of course, the most prolific story-teller for science fiction and fantasy. The man who scared us with book burning with his 1953 sci-fi thriller Fahrenheit 451, which was recently turned into a television movie starring Michael B. Jordan (Creed, Black Panther). What I liked most was the way the stage was set up, great going to the talented crew who did a phenomenal job. When seated, an Android draped with a blue cloak, black hood and wore a gold mark keeps careful watch as audience members were finding seats. On the left side is a corner office with an actual typewriter, along with a Mickey Mouse phone. Portraits of a Martian, the Bride of Frankenstein and a huge hammer under the desk reminiscent of the one that superhero Thor uses to make his presence known. Actor Charlie Mount comes out holding a crystal ball while conversing with the audience. You can do a double and triple take and you would think it was actually Bradbury. The resemblance is uncanny. Sharply dressed wearing the trademark oversized black glasses and white hair tamed on the sides and stacked high on top. Mount is charismatic and engaging. He dives in deep as Bradbury. Seven people dressed as astronauts are ready to get to Mars. The space travelers involved are married couple Bob and Carrie Prentis (Michael Perl and Melissa Lugo), Albert Beck (Paul Gunning), Leonard Craig (Joe Seely), the holy Bishop Kelly (John T. Cogan), an overly enthusiastic Young Barton (Richard Mooney) who later on, turns into miserable Old Barton (Don Moss) who lost faith in the mission and became bitter and pissed off. Everyone has their own issues to work out. Unfortunately, they have to solve their problems with others. It’s hard to do when you’re in tight quarters. Just saying! Mooney does a great job on being the only traveler looking forward to what will happen. He’s a naturally cheery, optimistic with his Colgate white smile and non-infectious go get’em attitude. Throughout the show, Mount gives out tidbits about his alter ego and some writing advice. Bradbury wrote Fahrenheit 51 in nine days. He strongly advised writers of all levels to write one short story a week for a year. When he started out, Bradbury didn’t have a novel to promote to book editors. Feeling hopeless and let down, Walter Bradbury, a Doubleday editor (no relation to the author), strongly advised Bradbury to take his short stories and bind them together. This is what will be later re-titled The Martian Chronicles. Bradbury stayed up all night in a room he rented at the YMCA in New York in 1959, for 50 cents a night. The Emmy-Award winner stayed up all night and completed an outline. He took it to Doubleday the next morning and left with a $750 check (in today’s money would amount to $7,671.91). He narrates the astronaut’s activities constantly changing a scene or a word to make it flow together. The actors take it all in stride and quickly switch from minute to minute going along with the author’s hurried suggestions. It’s the perfect formula and makes the show click into a rapid-fire pace. Clearly, it is Mount’s unwavering charm and delight in the role that makes it mesmerizing and fun to watch. Mount and writer/producer/director Jeff G. Rack took a page from Bradbury’s success playbook (in his lifetime, Bradbury wrote 27 novels, over 600 short stories) of combining short stories to create one novel by piecing together four short stories and made a piece of work so original and meaningful that Bradbury, the winner of the 2007 Pulitzer Citation Jury prize would whole- heartedly approve. 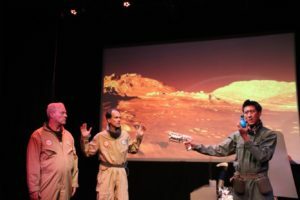 MARTIANS: An Evening with Ray Bradbury plays Friday nights until November 2nd and Saturday, November 3rd at 8 p.m. at the Whitefire Theatre, located at 13500 Ventura Blvd (at Sunnyslope), in Sherman Oaks. 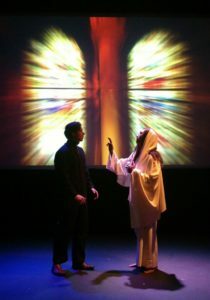 For ticket information, call (800) 838-3006 or reserve online at www.whitefiretheatre.com.